What programs claim to decrease student discipline infractions? What impact do they have on students of color and their sense of belonging and academic engagement? What approaches could educators use to ensure our students of color in integrated schools are succeeding in classrooms? RSVP through our registration form. Interested in seeing a particular topic presented for next year? Any questions about RIDES programming? Want to be included on our mailing list? Please email rides@gse.harvard.edu, and let us know! Our most recent webinar was on April 4, 2019. The video recording of the webinar is now available for streaming. How can we create a sense of belonging in our integrated schools for our ESL, immigrant, refugee and undocumented students? We hosted a webinar on March 7, 2019. How can we engage and cultivate students to become equity agents when many school efforts to increase equity treat them as subjects of improvement efforts designed and implemented by the adults? This month's topic was a 1.5 hour interactive discussion on how we can systematically include students as partners with adults in equity improvement work. The session highlights how powerful those disruptions can be – and the challenges of sustaining them – by bringing together the voices and experiences of high school students along with teachers and administrators who are working with them. Our guests inlcuded faculty and students of West High School of Iowa City, Iowa and The High School of Fashion Industries of New York, New York. We hosted Part II of our 2-part webinar on February 27, 2019. As a continuation of the prior topic on De-centering Whiteness, we welcomed Dr. Pedro Noguera, Distinguished Professor of Education at the Graduate School of Education and Information Studies and Faculty Director for the Center for the Transformation of Schools at UCLA. 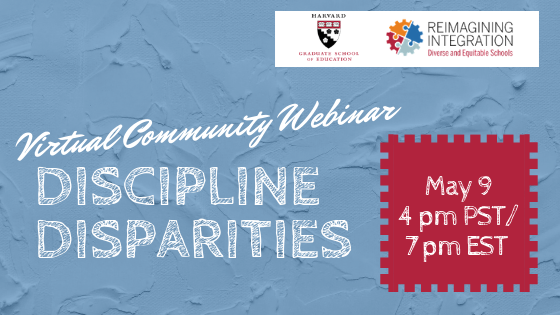 He will share his expertise on race and ethnic relations with regard to centering students who are traditionally disenfranchised within urban school reform efforts. Dr. Noguera's presentation slides are now available for download. We hosted Part I of a 2-part webinar on February 7, 2019. This month's topic was a 1.5 hour interactive discussion with Kim Feicke, former Director of the Oregon Center for Educational Equity and national consultant on race, class and gender equity, along with Manuel J. Fernandez, Founding Head of School at the Cambridge Street Upper School; Co-Founder and former Executive Director of Empowering Multicultural Initiatives. They shared their insights, problems of practice and ways of being in order to address dominant cultural norms of Whiteness and its impact on school staff, students, and families. Last month's webinar was on January 10, 2019. This month's topic was a 1.5 hour conversation with Zaretta Hammond, national education consultant and author of Culturally Responsive Teaching and the Brain: Promoting Authentic Engagement and Rigor for Culturally and Linguistically Diverse Students. Ms. Hammond shared her passion and unique perspective on the intersectionality of equity, literacy, and culturally responsive teaching. Check out her blog at CRTandtheBrain.com. Our second webinar was on Thursday, December 13, 2018. This month's topic was a 1.5 hour interactive discussion on how we can use human resources to create diverse, inclusive, rigorous and welcoming learning environments for staff and students. Our presenters were HGSE Doctoral Candidates, Dia Bryant and David Baiz. Our first webinar was Thursday, November 1, 2018. The video recording of the webinar is now available for streaming. To access the presentation slide deck, click here. This month's webinar topic was a 1.5 hour interactive presentation and discussion of Lessons on Leading for Equity. Our guest speaker joining us was Mary Antón, Ed.D., Lower School Director from the Chinese American International School in San Francisco, CA.